REDWOOD CITY, Calif. and LONDON, April 10, 2019 /PRNewswire/ -- Equinix, Inc. (Nasdaq: EQIX), the global interconnection and data center company, today announced that global law firm HFW has collaborated with Equinix to build out its digital edge in key markets including Dubai, London, Hong Kong, Melbourne and Paris. As a critical element of their digital transformation journey, HFW has distributed its IT to be closer to customers and employees, which has enabled the firm to increase the overall quality of experience (QoE) for these end users. Additionally, by leveraging Equinix for its data center needs, HFW has been able to free up valuable internal resources and redirect those resources to the development of value-added services on top of its platform which directly impact the customer experience and the firm's bottom line. HFW is a 136-year-old law firm that is undergoing IT transformation to prepare for the next wave of growth. As one of the first U.K.-based law firms to expand internationally, HFW now generates more than 60% of its revenue outside the U.K. and has seen its international revenue triple in the past seven years. As a result, the company needed a global interconnection platform like Platform Equinix® that provides the scale and reach to keep up with the pace of change and get the firm digital ready. HFW is an international law firm with creative, entrepreneurial and collaborative lawyers providing expert solutions on all aspects of international commerce. The London-based firm has more than 600 lawyers, including 180 partners, based in 19 offices across the Americas, Europe, the Middle East and Asia-Pacific. The firm has experienced rapid expansion, having grown from eight offices a decade ago. For this reason, HFW was looking to standardize its approach to IT globally and required a global data center platform with a consistent and reliable footprint to meet today's needs but able to accommodate future business needs. The practice of law and the delivery of legal services have become separate entities, with paralegals aided by technology and automation to offer new capabilities. Data-based insights are replacing traditional consulting, while consumers demand outcome-based billing and a responsive experience. According to the global study, "Future Trends for Legal Services"1 produced by Deloitte, 52% of legal services purchasers want technologies to be used and shared on integrated platforms. 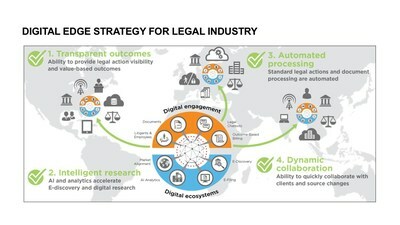 To compete, legal services firms are adopting a distributed interconnection platform that integrates digital and industry ecosystems, streamlines legal processes and adapts value chain architectures for a better customer experience. According to the Global Interconnection Index (GXI) volume 2, global Interconnection Bandwidth is expected to grow at nearly 10x the volume of internet traffic by 2021, as enterprises adopt interconnection for direct, secure data exchange. This compounding growth creates an opportunity for legal services firms to build exchange points near consumers, technology partners and service providers. The result is a digital platform of interconnected business and technology ecosystems that integrates AI, analytics and cloud capabilities for efficient delivery of legal services. Business architectures built on an interconnection platform gain the ability to integrate value chains, enable ecosystem collaboration and provide transparency. Data captured and analyzed near business partners, consumers and service providers enables real-time insights that drive efficiency and reduce costs. The result is a digital legal services firm that is customer-centric and industry-leading. As a key piece of its digital edge strategy, HFW has deployed Equinix Performance Hubs in select geographic markets. Equinix Performance Hub® implementations leverage WAN optimization and peering technologies to eliminate inefficient, costly WAN routes, network choke points and variable QoE. Equinix's direct and secure connections avoid the public internet and its inherent congestion and risks. This is especially important given the large file sizes that legal firms like HFW transfer between offices and the associated bandwidth required on their network. By adopting a distributed architecture, HFW also addresses increasing data privacy and other regulatory requirements and general data sovereignty concerns. As compliance rules such as the EU's General Data Protection Regulation (GDPR) require that organizations understand and control where their data resides, distributing applications through an interconnected network can support data residency and the data governance requirements. Today, the legal industry largely leverages private cloud, but it is expected that the industry will shift to hybrid cloud as the technology matures and the industry accepts these practices. Equinix Performance Hubs provide an easy on-ramp to hybrid cloud with integration to Equinix Cloud Exchange Fabric™ technology. This solution allows customers to access major cloud service providers such as AWS, Google Cloud Platform, Microsoft Azure and Office 365, and Oracle Cloud, regardless of physical location, by leveraging software-enabled virtual interconnection. By leveraging Equinix Performance Hubs, HFW protects its IT investment and ensures that it is cloud-ready. Legal services leaders are decoupling the practice of law from legal service delivery to meet customer demand and promote trust. A distributed platform allows them to tailor value chains to create innovative new services that are adaptable to local needs. By interconnecting cloud services, network service providers and technology partners on a global platform, these firms can replace traditional, fee-based business models with outcome-based services in a new and profitable era of digital legal services. "Business architectures built on an interconnection platform gain the ability to integrate value chains, enable ecosystem collaboration and provide transparency—all of which we have found on Platform Equinix. Data captured and analyzed near business partners, consumers and service providers enables real-time insights that drive efficiency and reduce costs. As a result, HFW is truly a customer-centric, industry-leading digital legal services firm." "An edge strategy is now crucial in every digital transformation project. IDC's surveys reveal that delivering a better customer experience at the customer location and enabling new digital services, with faster response time and real-time analytics, are among the main drivers for moving intelligence towards the edge of the networks. Dealing with multiple edges is not an easy task, and platforms like Equinix's are crucial to mitigate the network complexity and optimize the cost of content delivery in multiple locations and geographies. In a highly regulated industry like Legal, edge not only opens the way to new outcome-based business models, enabled by distributed AI capabilities, but also guarantees the highest level of privacy, security and regulatory compliancy without requiring the data to be transferred outside virtual or geographical boundaries." "It is great to see a forward-thinking firm like HFW strategically thinking about the way IT can add value to the customer experience and become a true differentiator for its businesses. HFW placed control points within Equinix colocation hubs to locally interconnect clouds and networks and to redefine its digital capabilities—reducing costs and latency while significantly improving speed, user experience and capacity." Equinix,Inc. (Nasdaq: EQIX) connects the world's leading businesses to their customers, employees and partners inside the most-interconnected data centers. On this global platform for digital business, companies come together across more than 50 markets on five continents to reach everywhere, interconnect everyone and integrate everything they need to create their digital futures. www.equinix.com.